Robinson Crusoe has been reprinted, edited, and abridged for publication for both adult and juvenile audiences for three centuries. This edition of the Robinson Crusoe trilogy is, "The whole three volumes faithfully abridg'd and set forth with cuts proper to the subject." 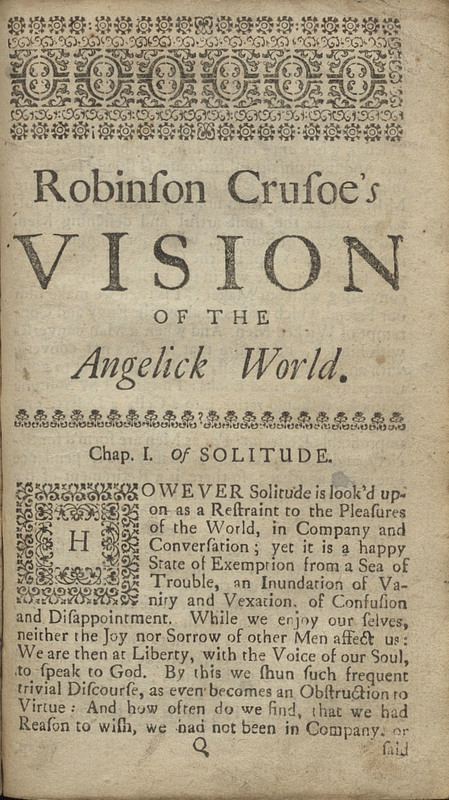 Displayed is the third part of the sequence, which was originally titled Serious Reflections During the Life and Surprising Adventures of Robinson Crusoe: With his Vision of the Angelick World. The Life and Most Surprizing Adventures of Robinson Crusoe, of York, Mariner: Who Lived Eight and Twenty Years in an Uninhabited Island on the Coast of America, Lying near the Mouth of the Great River of Oroonoque: Having Been Cast on Shore by Shipwreck, wherein all the Men were Drowned but Himself: as also a Relation How he was Wonderfully Deliver'd by Pyrates. London: A. Bettesworth, 1724.